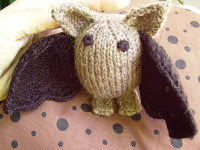 Very sweet and quite easy to knit - I did change the ears and used slightly thinner yarn and needles than suggested which has made this Bat just the right size to fit in my hand. 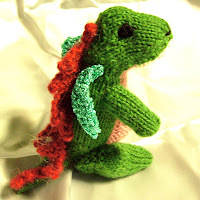 D is for Dragon - well originally, and in keeping with the attempt to make this alphabet as Australian as possible, D was going to be a Dingo, but I couldn't find a suitable pattern then I was thinking of a Drongo which is a bird (as well as Aussie slang for a somewhat silly person) but then I rediscovered Norberta, on knitty.com a very cute baby dragon. Again I used 8ply (DK) and so this one is smaller than pattern suggests, and I used lots of different yarns including bright metallic for her "fairy wings". 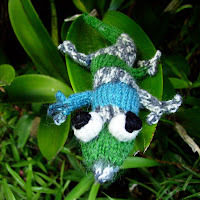 Well, I'm not knitting these in alphabetical order - so skipping right along to G for Gecko - another clever and cute pattern by Cheezombie on Etsy. 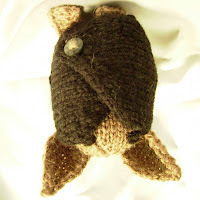 Self patterning sock-yarn made for some good banded effects and I just love the goggly eyes!